Brush lettering is how I got started on this journey and I think that it is such a fun hobby to pick up that you can use in many aspects of your life. Some of you reading this may be beginners, some of you may be more advanced, so I'll specify materials for different skill levels. When I first started with brush lettering (first of all, it was not pretty at all so don't expect perfection at first), I went to the Blick Art Materials website and purchased probably 15 different types of brush markers to try out. Luckily, you won't have to do that because I have already found ones that I like and ones that I didn't. But if you want to buy a bunch of different types, by all means do so! The brush pens that I found easiest to start with are Tombow Dual Brush Pens. These have one end that has a brush tip and then a bullet nib on the other. They are sold in packs, or separately and are pretty reasonably priced. They are water based, meaning you can use water to blend the colors together. However, they blend pretty easily on their own as well. When I was first starting, I found that the flexibility of the Tombow nib was really forgiving. It is flexible, yet sturdy in order to give you some stability when writing. If you want to start brush lettering, these are the way to go. If you are more experienced and haven't tried Tombows yet, I would definitely recommend as well! They are great for all skill levels as the brush can create many different effects and lettering styles. If you want many colors but can't afford Tombow's, believe it or not Crayola Markers can be great for brush lettering and are very inexpensive. They are a bit harder to use just because they don't have as much flexibility as the Tombows. 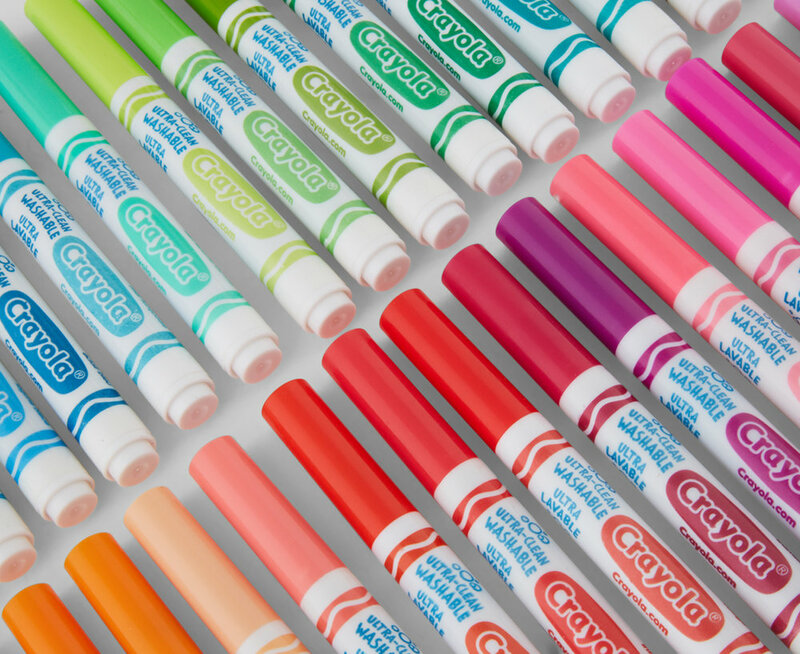 But if you can master lettering with Crayola, other marker brands will come a lot easier to you. These are also water based, so they will blend with water. However, trying to blend the colors without water will be a bit more difficult, but it can happen! 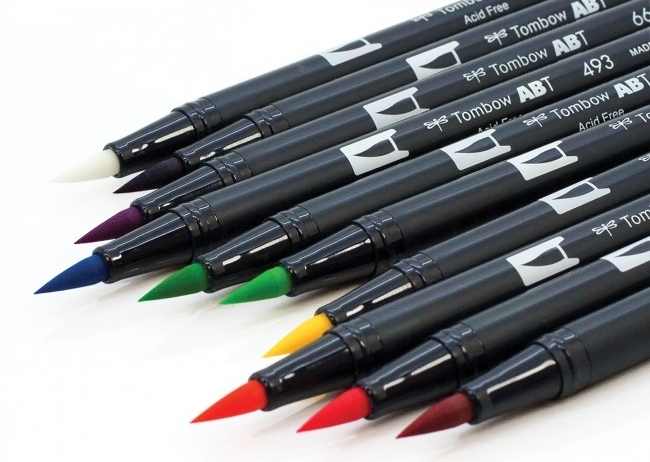 Another great choice is the Artline Stix line of markers. These are not available on dickblick.com, however they are available on Amazon. These are fun because they actually look like legos, so you can attach them (even though that has practically no use for lettering, they're fun to play with!). These markers are known for creating and ombre look to them by varying the pressure that is added. If you are just starting, don't worry about that quite yet, you want to get your lettering down first! These also have a firm tip, probably in between the Crayola and the Tombow. The downside of these is that they don't offer many colors which would be a worry down the road if you start to really enjoy these. For practicing, colors aren't too important. Last but not least, Copic Markers are great, but they are a bit different. For starters, they are alcohol based instead of water based which means a few different things. You cannot use these on regular printer paper because they will bleed. The Copic company sells their own paper you can use, or any other marker specific paper will do. This also means that they won't blend with water if you want a smooth transition between colors. However, they do blend very easily on their own so I never found it to be a problem. An issue with these is the price; these markers are an investment for sure. If your budget doesn't allow it, Copics are not necessary for learning. If you are more advanced, they do have a great brush for lettering to allow many different styles, and they have hundreds of color options for you to choose from. They are also refillable, so if your marker runs out of ink, you can buy ink to refill it. And that just about wraps up my favorite supplies to start with! A blog with tips for brush lettering will be coming shortly so stay tuned! Welcome to my first blog post! This will be a place where I will update all of you on recent projects, give you tips and tricks for lettering and calligraphy, post my most used supplies, and post about other various art related topics. With that being said, my first blog post will be dedicated to my favorite project so far, the Nasty Women of the North show. This was the most fun I have ever had on a piece, and the most hype I have ever gotten on a project from the people who saw it. This piece was for a show called Nasty Women of the North, and it was held at Collar Works Gallery in Troy, NY. All of the works in this show were donated by the artists and sold for under $100, and to top it off 100% of the proceeds were donated to Planned Parenthood! Before starting this, I was a bit nervous considering I have never done a painting that expanded beyond the borders of an average sized canvas. The only information I got before starting was the size of the wall, and the name of the show. The rest of it was left up to me and my process. Once that was all set, I had all of the prep work done. Well, that is besides getting all the paints, laser levels, brushes, yard sticks, rulers, ladder etc etc etc. The whole painting took me about 3 hours start to finish, but with my headphones in jamming to old Taylor Swift, it went relatively quickly. I have never completed a project that I was this proud of. The fact that I could do what I love, market myself in this way, and contribute to an organization that is very meaningful to me, made this the perfect project. The next morning when I woke up I saw it all over Instagram; a feeling best captured by the saying, "Mama, I made it." Ever since I painted that wall I have been itching to get back out there and paint as many walls as I can get my hands on. I have another gallery show coming up in the beginning of December and I plan on doing a few murals there and possibly selling prints of them. If anyone has a wall that is a little too blank for their liking, or has a small business that is just begging for a mural, shoot me an email and I would love to help! I was also lucky enough to be able to capture the whole 3 hours into a 2 minute time lapse -- check it out!